The KORE3 Hybrid Big-Brake Front Caliper Bracket Kit is the latest evolution in big-brake options for GM tall-spindle applications. 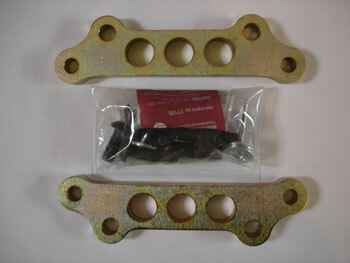 These brackets adapt 355mm x 32mm [14" X 1.26"] C6 Z06 rotors and twin-piston C5/C6 calipers to your GM tall-spindle application for maximum stopping power and value. 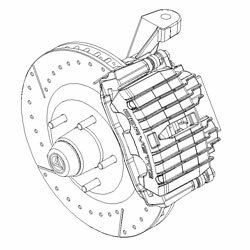 Please refer to the KORE3 Big-Brake Application Chart for details regarding specific vehicle compatibility. KORE3 GM Tall-Spindle Kit is designed for GM tall-spindles only, of which there are three (3) variations, four (4) counting the ABS applications such as the 1994-1996 Impala SS. All tall-spindles are cast and the KORE3 brackets work with all four (4) variations. 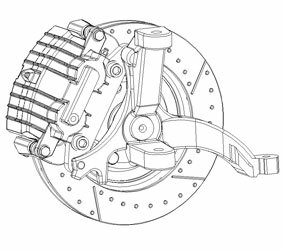 The differences are important to note when selecting hubs to run with our big-brake conversion. Kit installation requires moderate, irreversible spindle modifications with basic metal fabrication tools. All necessary modifications are detailed in the instructions. Minimum �18"+ wheels are required for caliper to wheel clearance. Not all �18" wheels will fit, depending on wheel design and overall width and offset/backspacing. Please verify fitment prior to ordering using the appropriate KORE3 fitment template. Wheel fitment is the buyer's responsibilty. Please contact us if you have any questions regarding your specific application or the proper use of the templates.